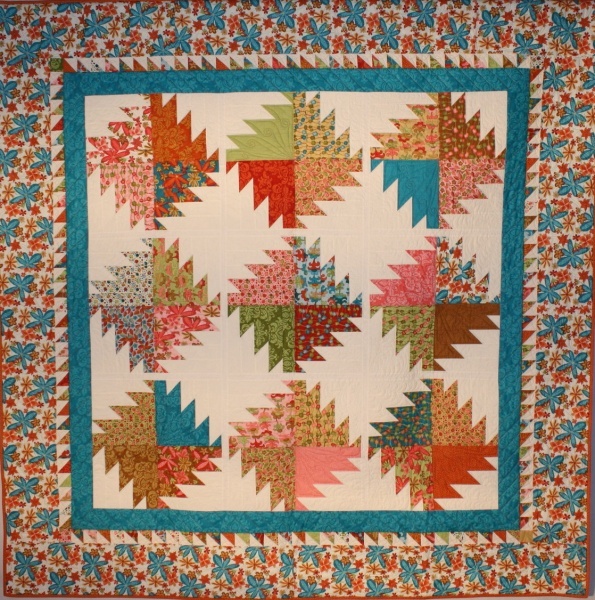 Three / Four Hour Class – With some basic preparation and rotary cutting in advance as outlined in the supply list, students will learn the technique and be able to construct at least one or two blocks in class and leave with the confidence and expertise necessary to complete the quilt at home. 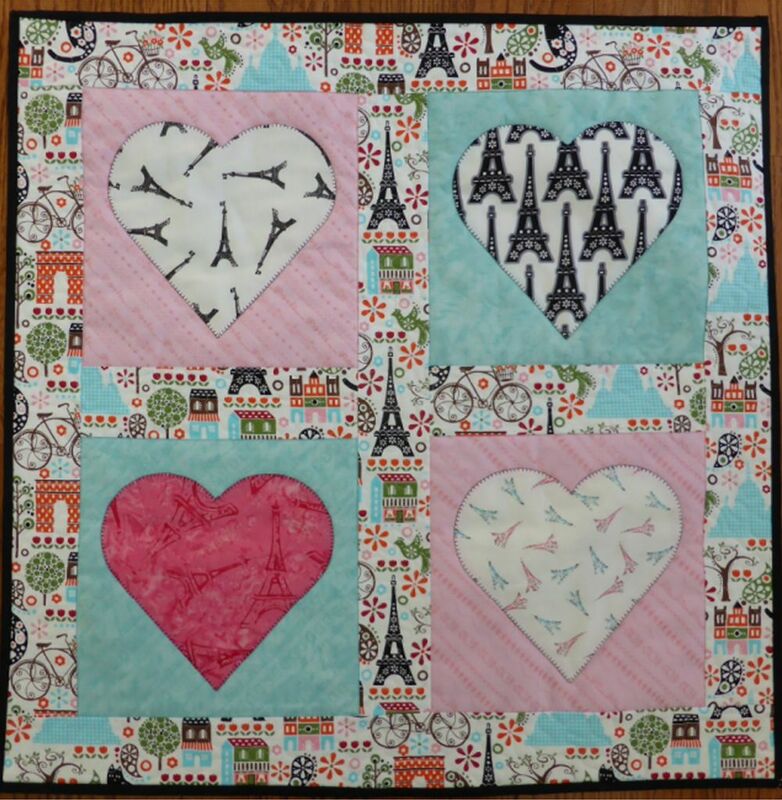 Six Hour Class – With some preparation as outlined in the supply list before class, students will learn the technique and have ample time to construct blocks and piece a major portion or possibly the entire quilt top during the workshop. Choose a class or workshop featuring my signature methods of fast, accurate rotary cutting and speed piecing or appliqué techniques! I’m one of those rare instructors who never, ever requires any student to purchase my rulers to attend class. Students are free to borrow a ruler for use in class from me! Kimberly’s most popular class; this one sells out wherever she teaches it! All it takes are 40 – 2½” strips from a purchased precut bundle or strips cut from your own stash, plus one background fabric and the diamond design possibilities are practically endless! Kimberly will teach you how to strip-piece and cut diamond building blocks from strips using her EZ Jelly Roll Ruler or new Precision Precuts Ruler with no “Y” or set-in seams. 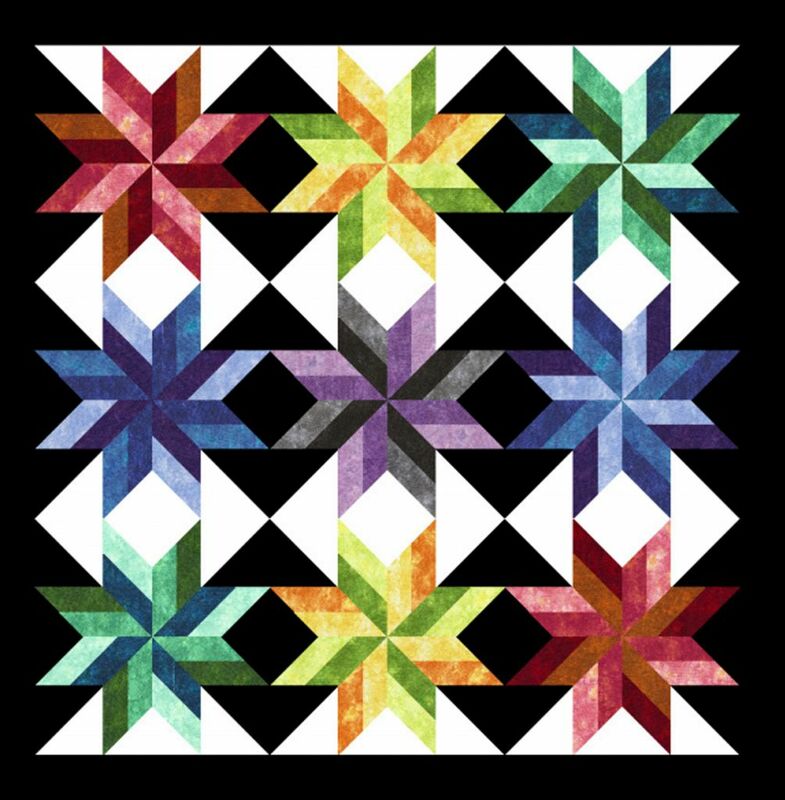 You’ll design your own unique Lone Starburst variation quilt! The first part of the class focuses on accurate and efficient cutting and piecing of the diamond units and the latter part of the class will focus on design elements and the almost limitless possibilities for designing your own layout using your diamond units. The real magic comes from the fact that the quilt is assembled with straight-set blocks, not diamond wedges or blocks on point. 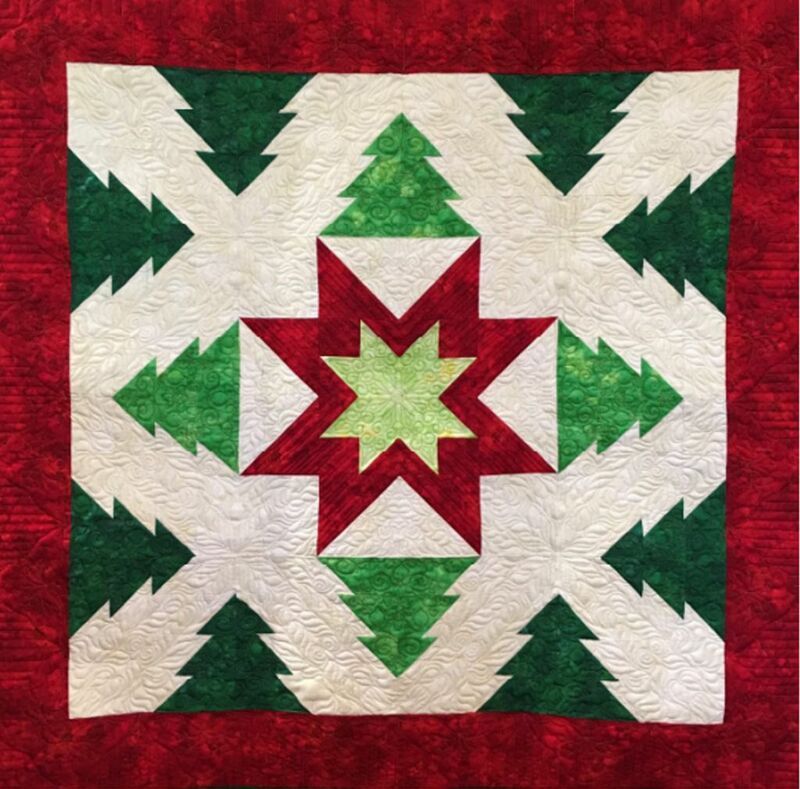 This is an eye-opening class for anyone who wants to create a one-of-a-kind quilt with a Lonestar twist! This brand-new variation of Kimberly’s most popular class and is sure to be another sell-out workshop! You’ll need just one Jelly Roll bundle (or 40 – 2½” strips cut from your stash) plus one background fabric. The diamond design and quilt layout possibilities are still ractically endless but this version comes with a spontaneous twist! You’ll stitch your strips together randomly for a vibrant and completely surprising color-scheme! Kimberly will teach you how to strip-piece and cut diamond building blocks from strip units using either her EZ Jelly Roll Ruler or new Precision Precuts Ruler with no “Y” or set-in seams. You’ll focus on accurate and efficient cutting and piecing techniques and Kimberly will share her best tips and tricks for achieving perfect, flat blocks with sharp star points. The real fun comes as the quilt is assembled with straight-set blocks, not diamond wedges or blocks on point. This process of not having to think about fabric placement is truly freeing. So, choose a bundle of strips and join in the fun! be another best-selling class, so sign up early! 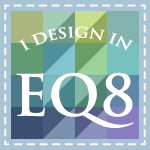 Create your own version of Kimberly’s spectacular, multi-award-winning quilt! 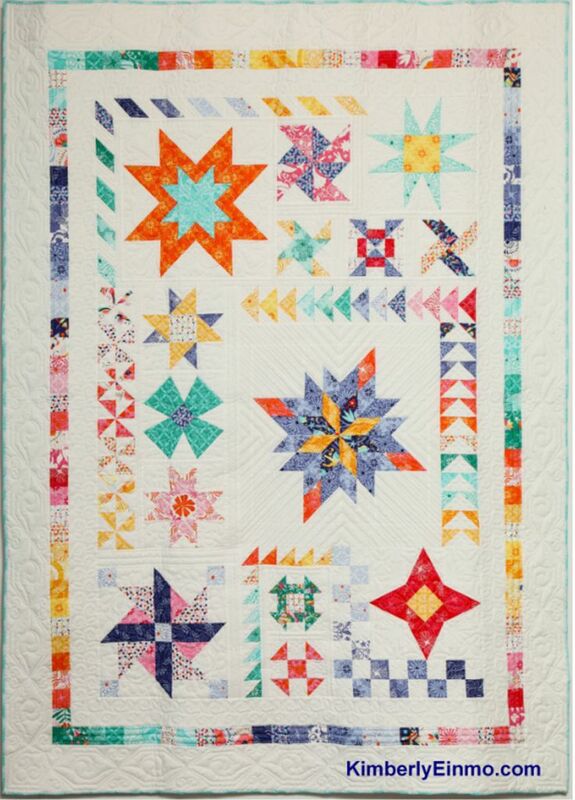 This modern version of Kimberly’s signature Lone Starburst technique may look complicated to piece, but it is actually constructed from straight-set blocks with no “Y” or set-in seams using her EZ Jelly Roll Ruler or brand-new Precision Precuts Ruler. You’ll learn how to expertly strip piece 2½” strips and accurately cut them into diamond units. Kimberly will show you her magic “one-pin-technique” for achieving absolutely perfect points plus many other tips for creating blocks with perfect ¼” seam allowances so you’ll never cut off another star tip again! With a little advance cutting you’ll learn everything you need to complete this 80″ x 80″ quilt at home. Come spend a productive day in class and learn Kimberly’s helpful hints for precision piecing without any stress or frustration! stress-free so you can take a risk with your fabric selections or risk nothing at all. Step out of your “quilt comfort zone” and try something new. If your fabrics have good contrast, look great when lined up together, and match the values given in the fabric requirements table, then they’ll look beautiful when sewn together. Not sure, simply email Kimberly at moc.omnieylrebmiknull@ylrebmiK and send her a photo of your fabrics. She’ll make sure you’re on the right track! Join Kimberly for this fabulous, new class! 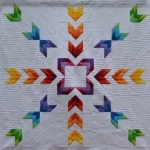 This super fun-to-make quilt combines nifty rotary cutting and piecing techniques using Kimberly’s EZ Flying Geese Ruler. The surprise comes from the fact the pines are ‘hidden’ in pieced blocks that look don’t look anything like trees until you set the blocks together! 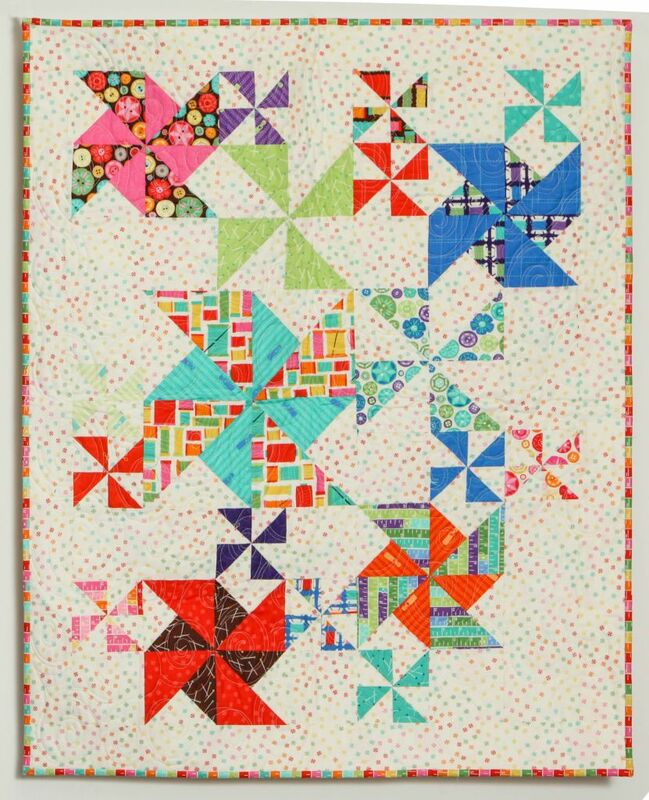 Let Kimberly show you her signature method to make the star-in-a-star block with no math, no wasted fabric and no stress and then piece your “hidden pine” blocks to complete this pretty (and clever) quilt. 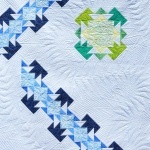 The pines “turn the corner” of the quilt in complete symmetry with ease! This original design will look great with any fabrics including traditional prints, batiks, Kimberly’s Solid-ish line, and especially in Christmas colors! Are you ready to create a terrific new quilt design that’s fast and fun to construct? 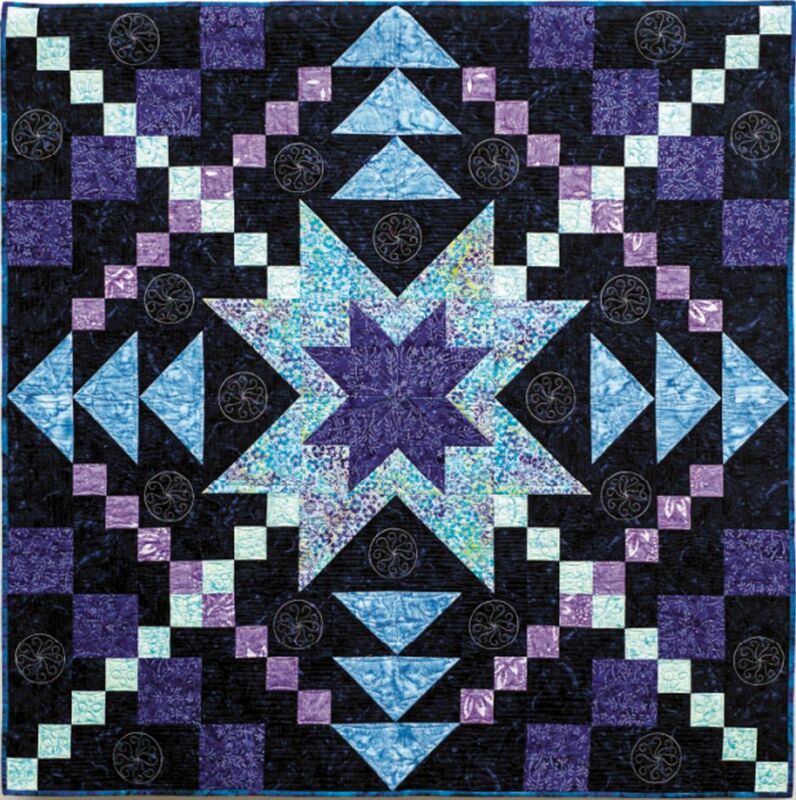 This striking, original quilt can easily be made from 18 – 10” (Layer Cake) squares and background fabric (plus a little extra for the arrows). 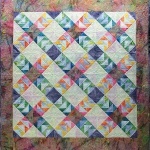 Kimberly used her sumptuous Solid-ish line of fabric to make this version, but eighteen of any 10” squares will work. Choose fabrics from your stash or dive into that special Layer Cake bundle you’ve been saving. 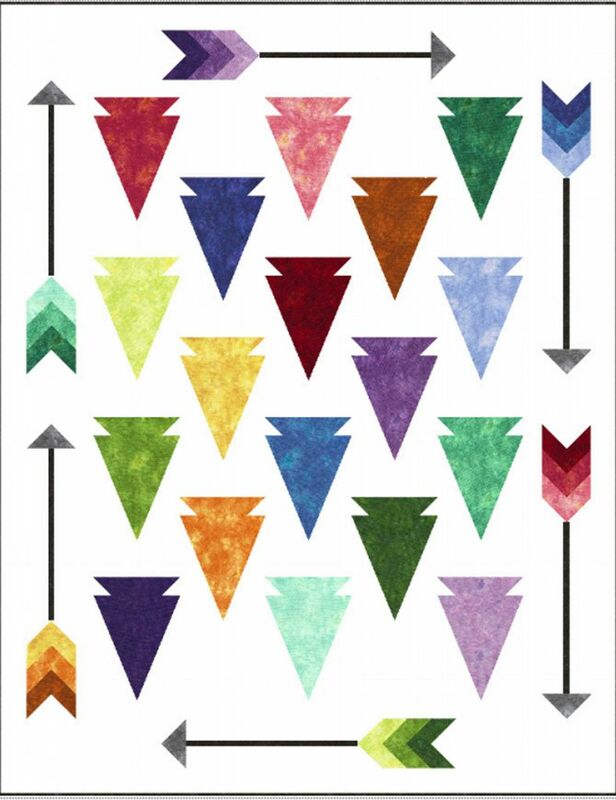 It’s easy to construct the arrowheads and you’ll use Kimberly’s EZ Flying Geese Ruler and the leftover bits of fabric from each of those squares to make the colorful feathers on the arrows. This technique is super-fun and completely stress-free! So, come join Kimberly and create a quilt that will be cherished and loved. 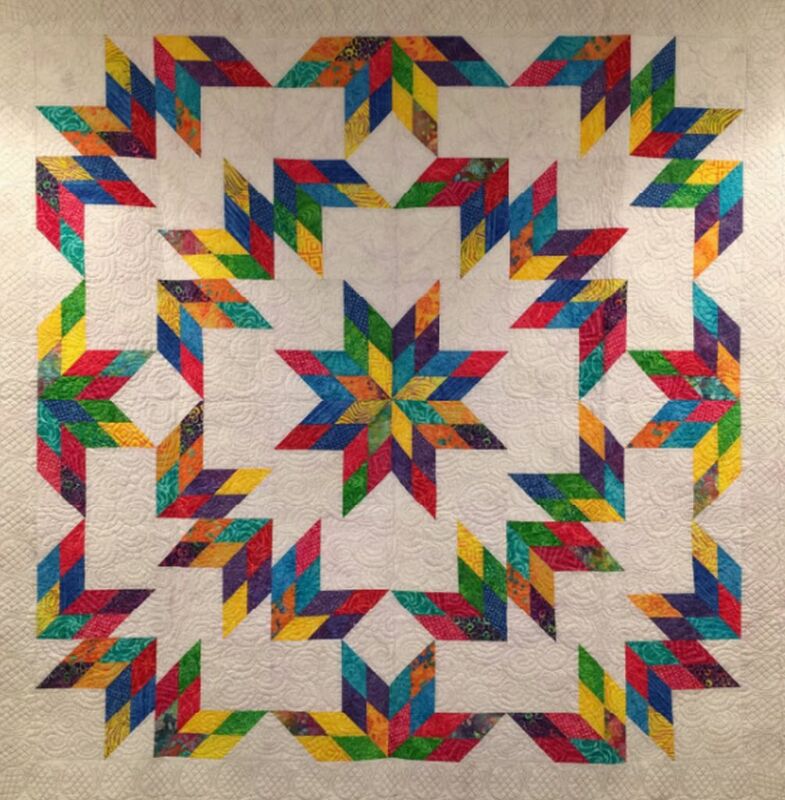 This quilt is a fabulous fusion of modern aesthetics and traditionally-pieced units combining Kimberly’s best rotary cutting and precision piecing techniques! 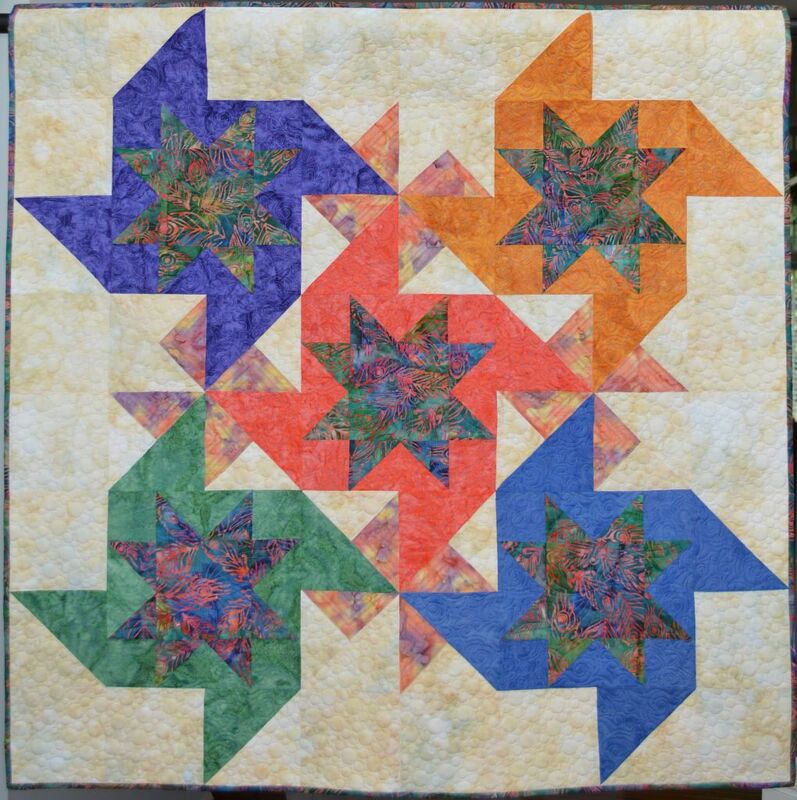 She’ll teach you how to accurately cut your units from strips and assemble them using her signature EZ Flying Geese Ruler method for making no-fail, half-square triangles and flying geese units using no math, no wasted fabric, and no stress! 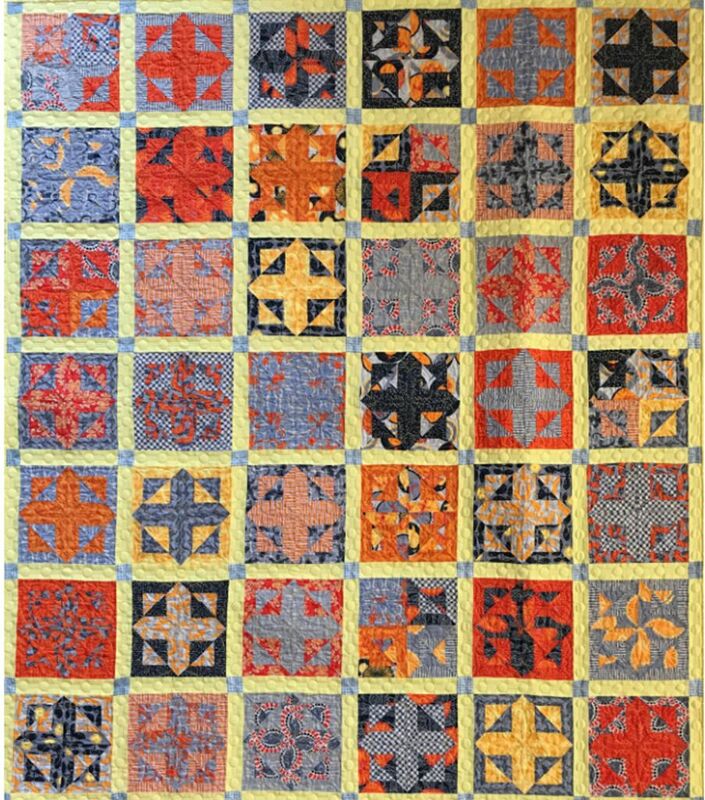 See traditional units in a fresh, new perspective to embrace some qualities of modern quilting without sacrificing your love for traditional machine piecing. 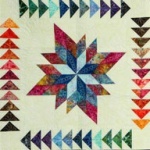 Kimberly will provide lots of hands-on, personal attention to help you explore winning color combinations and layout possibilities just a “wee bit outside of your comfort zone.” Learn everything about half and quarter square triangles — and why they matter — while having fun in the process! Enjoy a stress-free day of sewing and leave feeling refreshed and inspired! 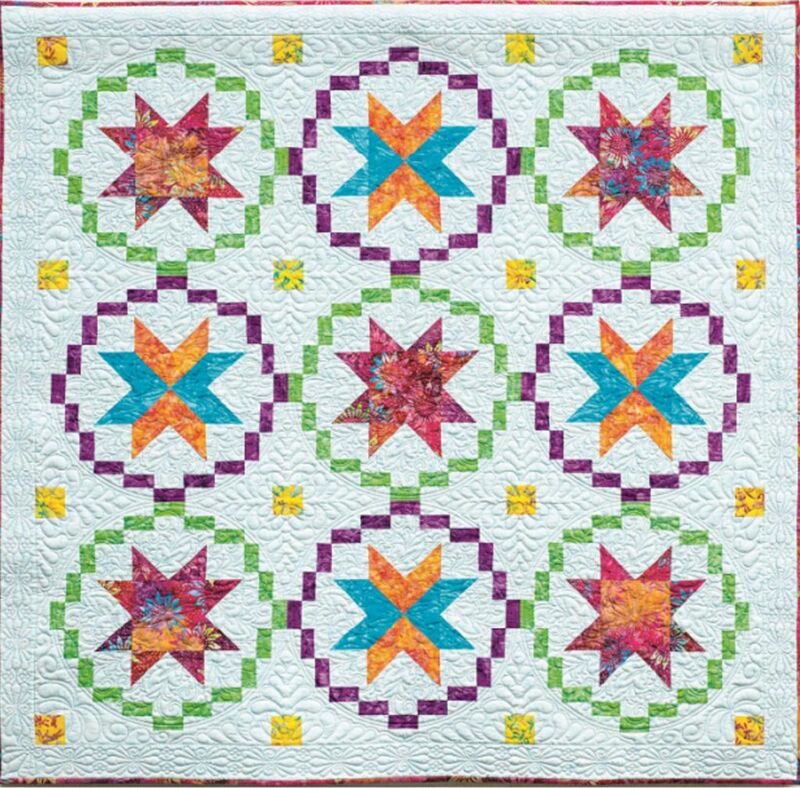 Learn to create this gorgeous variable star with a pretty pinwheel twist from simple strip units. Best of all, Kimberly will teach you both of her signature techniques to construct the beautiful center star using her EZ Jelly Roll Ruler or her brand-new Precision Precuts Ruler, plus how to make fast, fabulous flying geese with perfect points using her EZ Flying Geese Ruler! Best of all, there are no “Y” or set-in seams which makes block construction truly a breeze! You’ll learn top tips for ultra-accurate rotary cutting and precision piecing with ease and how to customize the star design to make it your own. Jelly Roll bundles are perfect for this project but this makes a great stash busting quilt as well; just add one fabric for the background. 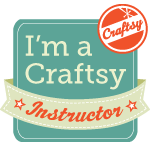 You’ll have a great time in class with Kimberly as your very own personal quilting coach! assembling your quilt top at home! From Kimberly’s newest book, Clever Combo Quilts, this design combines the best elements so you can perfect the art of accurate rotary cutting and hone your precision piecing skills! Using Kimberly’s EZ Flying Geese Ruler and EZ Jelly Roll or Precision Precuts Rulers, you’ll make various sizes of fabulous flying geese with no math, no wasted fabric and no stress! You’ll also learn the fastest – most accurate method for cutting and piecing four-patch units, and how to piece this design using straight set blocks. Learn how to create secondary design elements using clever fabric placement. Customize this design by choosing your favorite fabrics with either a dark – or light – background. 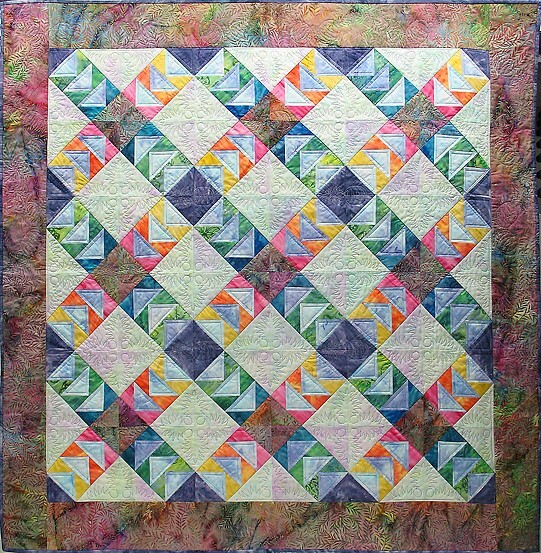 Come spend a great day in class learning Kimberly’s best tried and true piecing methods! This challenging-looking quilt simply could not be more fun or easy to piece! Choose as few as two different fabrics or make it super scrappy and use up to 40 fabrics and bust your stash! Simply cut your strips in advance as directed on the supply list and come to class prepared to sew. With some rotary cutting magic and Kimberly’s EZ Flying Geese Ruler, you’ll create blocks which look as if they have set-in seams (Shhh! It’s all straight sewing….) This is a perfect low-intensity class for your guild retreat or evening workshop. Kimberly will share all sorts of fun tricks and techniques to help you master your rotary cutting and precision piecing skills, and you’ll simply love making this quilt. You’ll be able to choose the size of your blocks in either 6”, 8” or 12” sizes. Make many blocks in class and leave class with all the skills and techniques you’ll need to finish at home. 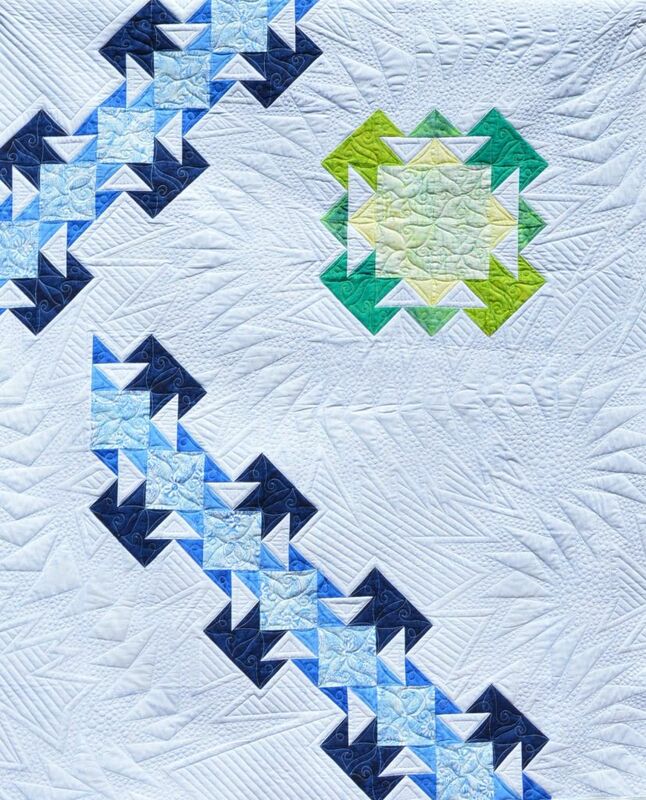 Thanks to Kimberly’s clever design and signature technique for making no-fail flying geese units, this gorgeous quilt is comprised of straight set blocks that give the illusion of diagonally set rows. Only you’ll know how easy it is to actually construct! Flying Geese Crossing is the perfect way to feature one of those luscious precut strip bundles or favorite fabrics from your stash. The best part about Kimberly’s signature construction method using her EZ Flying Geese Ruler is that there is no math, no wasted fabric, and no stress to make flying geese! Come prepared to spend the day creating a glorious quilt that is easily customizable to fit a wall or any size bed. You’ll finish the class as a pro at making flying geese from simple strips, plus you’ll have a great time spending the day learning so many tips and tricks from Kimberly! Fresh as a breeze, this quilt is an absolute delight to make! Kimberly will teach you everything you’ve ever wanted to know about triangles and bias edges. 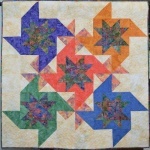 You’ll learn to expertly cut half-square and quarter-square triangles easily and accurately from simple fabric strips. No more cutting awkward size squares and then cutting them diagonally. Sound impossible? Not with Kimberly’s signature technique and her EZ Flying Geese Ruler! You’ll be able to piece the blocks without worrying about those bias edges or multiple steps for trimming units, and best of all, NO PINS! (Really!) 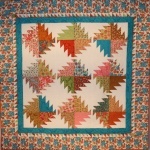 This quilt features small and large size plus single and double pinwheels with a twist. Lots of fun and chock-full of hints and clever tips, come join the fun and create a pretty quilt of fancifully colored pinwheels with perfect points! In this high-energy class, Kimberly will teach you her precision cutting and piecing methods while keeping you entertained with my own style of humor and sunny disposition. Her signature technique features no math, no wasted fabric and no stress using her amazing EZ Flying Geese Ruler. 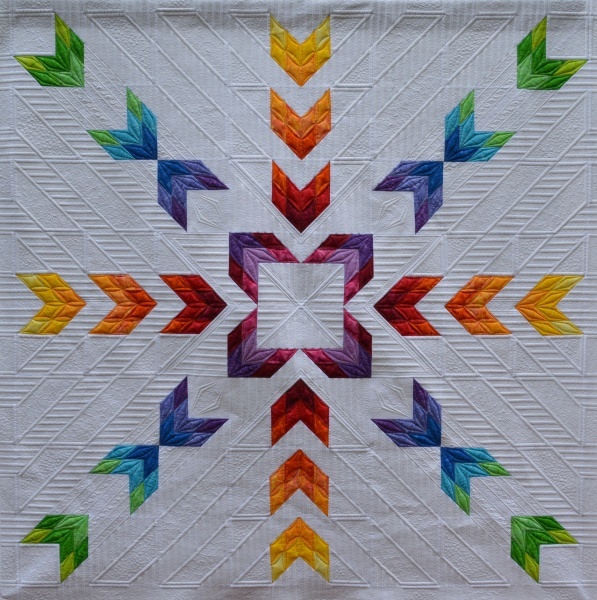 You’ll love this magic method for piecing perfect flying geese, accurate half-square triangles from whole and half-size strips, and pretty eight-pointed stars while constructing a gorgeous quilt top! But this is only where the fun begins. Kimberly will show you how to expertly piece pinwheels with perfect points without the use of pins. (Really!) Learn everything these is to know about triangles and so much more. 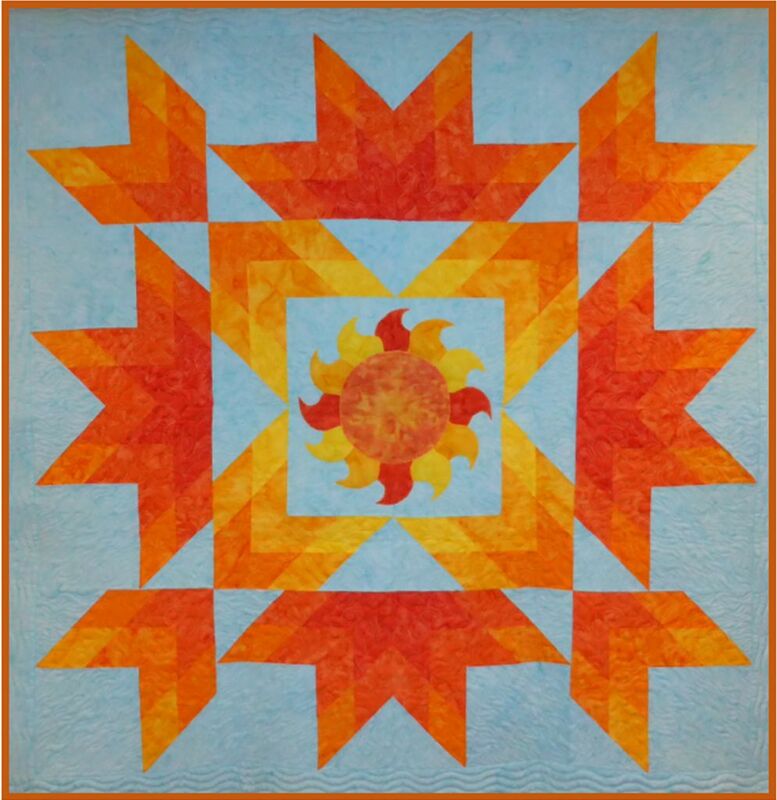 The creative energy will flow as you create a fabulous quilt that looks complex; only you will know how easy it is to put together with straight-set blocks! Have you ever wanted to learn the secret of strip-piecing Lonestar-style diamonds with ease and accuracy? In this fun-filled, no-stress class, Kimberly will teach you to quickly and expertly cut and piece diamond units from simple strip sets. The magic with her method is there are no “Y” or any set-in seams! 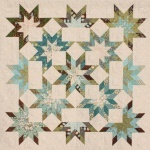 This fractured Lonestar quilt is constructed of straight-set blocks. Sound impossible? Not with her exclusive, signature technique. Kimberly has designed this new, smaller version of her exclusive and ultra-popular Lone Starburst pattern using fabric yardage instead of precut strips. Choose fabrics from your stash and do some simple strip cutting at home so you can get right to the sewing machine in class. You’ll learn Kimberly’s fabulous method and be finished with this stunning quilt top in no time at all! Come to class a novice and leave as a diamond piecing pro! Looking for a low-intensity class that is perfect for a guild retreat or evening workshop? This slash-n-shuffle style class is it! You’ll be able to assemble lots of blocks in a short time for maximum productivity! 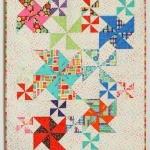 This fantastic quilt packs a visual punch yet is fast, funky, and just plain fun to make. No matter how you stack your fabric layers, once you begin shuffling the pieces, every block will turn out just a bit differently and the end result is guaranteed to be a delightful surprise. Pick any Layer Cake bundle (or 36 of your own 10” fabric squares) plus one dramatic contrasting fabric to make this original quilt. There’s no math and no wasted fabric – just no-calorie, fat-free fun. That’s like having your cake and eating it too! One of Kimberly’s biggest crowd-pleasers; the Chain Saw quilt always gets so many “oohs and aahs.” This stunning quilt looks incredibly complex, but is really very easy and sew much fun to piece! It requires just one Layer Cake and one Jelly Roll or you can make it with thirty-six fat quarters plus a background fabric. If you enjoy fun surprises when you rotary cut and sew, you’ll love this design. No matter what fabrics you begin with, whether from your stash or precut bundles, the finished blocks will look oh-so-different than what you might expect! Kimberly will share dozens of her most helpful hints and tricks with you so you’ll not only improve your cutting and piecing skills, but you’ll stitch these blocks together with absolute ease. Plus, learn how to make great use of the leftover bits by constructing a HST Sawtooth border using Kimberly’s EZ Flying Geese Ruler! 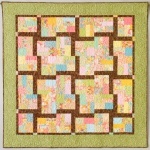 workshop to turn all those enticing 2½” strips, 10” squares and charm packs into a fabulous quilt. 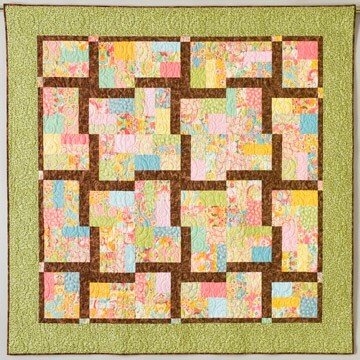 Let Kimberly introduce you to her signature technique called “modular piecing,” which is a system of simple, pieced units used to create new blocks, settings or complex-looking designs. Using a myriad of basic ‘building block’ units, Kimberly will show you how to piece a wide range of blocks in modular sizes. You’ll use her EZ Flying Geese, EZ Jelly Roll and newest Precision Precuts Rulers along with traditional methods to their best advantage with no math, no wasted fabric, and best of all, no stress! Kimberly will share every trick in the book for precision piecing and to create beautiful blocks and unlock your inner design diva. You’ll love her encouraging, upbeat, energetic (and humorous) teaching style, so join her and graduate as a precuts-pro! Add a whole new dimension to your machine appliqued quilt blocks by adding elegant textured background fabrics with shadow stitching! All it takes is background fabric, matching thread, and some beautiful, decorative stitches on your machine to take your blocks from ho-hum to stunning! You’ll explore endless possibilities of stitch combinations to accentuate your machine applique designs in this fun-filled and relaxed stitching class. After you’ve created the new background fabric, you’ll do some machine applique with high-contrasting stitches for the perfect flourish! Come spend the day creating your own unique background fabric and perfecting your machine applique skills. Lecture: Jelly Rolls + Precuts = A Recipe for Design Success! You’ve heard about them. You’ve seen them. Most likely you’ve even bought them. But what can you actually do with them? Well, let Kimberly introduce you to the delectable world of calorie-free fabric delights! These pre-cut bundles are pint-sized powerhouses of scrappy design opportunity just waiting for you to create fabulous quilts and more! Kimberly will share tons of photos, quilts, and more inspiration than you can imagine to tantalize your “inner design chef” and excite you to create something glorious using these amazing fabric bundles. 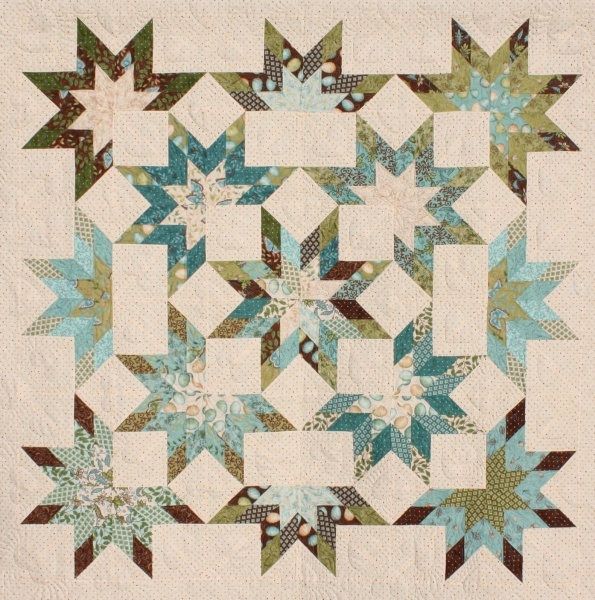 From basic beauties to the most exquisite award-winning quilts, Kimberly’s PowerPoint presentation is jam-packed with ideas and inspiration. Even if you don’t plan to use these pre-packaged fabric lines, you’ll find plenty of creative ways for stash busting from your own fabrics, and ways to use up those pesky leftover strips and squares. You’ll be scrap happy and itchin’ to stitch by the end of her presentation! Lecture: Creative Spaces: Turn your sewing room into a creative studio! Whether you have a small, shared room or the most palatial space, your sewing room should be a place where you feel happy and inspired to create! Being a military wife with 15 moves under her belt, Kimberly has set up sewing studios in each of her homes and is excited to share what she’s learned for making the most of the space you’ve got. She’ll share photos of her sewing rooms, her favorite (and not-so-favorite) features of what works and what doesn’t, and her best tips for setting up your own creative haven. 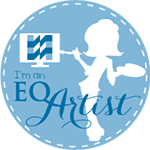 Then, sit back and enjoy a personal tour of today’s top quilting stars’ studios – both clean and cluttered – as they open the doors to their spaces and share their favorite features and tips that you can easily implement. This fun, informative, and inspiring ‘parade-of-homes-style’ visit will provide a wealth of ideas and tips for transforming your own space into a place where you can be your most creative! 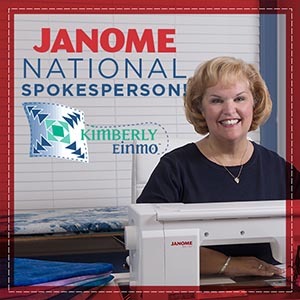 In this lighthearted and inspiring presentation, Kimberly will share her quilting journey by sharing stories, many of her actual quilts or photos through a fun and informative PowerPoint presentation. Learn about her creative process and how to find your own design inspiration in some of the most unexpected places! Stunning quilts can come from simple shapes and Kimberly is the master of clever fabric placement and basic block combinations to create original, dynamic, and eye-catching designs. Spend an hour or so enjoying her humorous stories and come away feeling inspired and uplifted with a fresh perspective and new-found confidence for designing your own unique and beautiful quilts!